Why Hindus worship so many gods and goddesses? Is the form of God important? Can God have only one form ? If He has only oneform, can we really call Him infinite? How can God have just one form? Does not it amount to limitation, having finite nature rather than infinite nature. Even as human beings, we appear differently during the different stages of our lives. All that you need to do is take out your own photographs taken during different times, moods and period of your life and place them in one frame together and look at them. You will be surprised at the amount of variation in your own looks and appearance during different times. If God is the true Creator and Ruler of this manifest universe, He must be carrying out diverse functions, in order to sustain it, protect it and manage it. Each of these functions require certain predominant qualities and skills specific to perform the tasks at hand. These aspects may be part of God or separate from Him for the purpose of His creation. They may be His aspects, emanations, manifestations, incarnations and creations. According to the tenets of Hinduism, God is one as well as many. In His highest and undifferentiated aspect, He is the unknown and indescribable primeval consciousness, known as Nirguna Brahman or Brahman without qualities. Under some mysterious circumstances, part of Him becomes active and distinguishes itself as Saguna Brahman or Brahman with qualities. He is the awakened Brahman and referred in the scriptures as Iswara or Lord of the Universe. He is to be found every where and in every thing. He is there in the sky, in the rivers, in the plants and trees and even in a particle of dust. He is an enigma, because He is in many things at a time and is many things at a time. He is visible as well as invisible. He is here and He is there. He is above and He is below. He is with forms and also without form. He speaks and He speaks not. He is the self and also the not-self. To say that this is God and this is not is perhaps much more sacrilegious, if there is anything like sacrilegious in the world of God, than seeing God in images and idols and worshipping Him. Hinduism recognizes this fundamental truth about God in letter and spirit. For the Hindus the whole universe is sacred, permeated by His presence, radiating His glory, sustained by Him and manifested by Him. Every thing in it and every aspect of it, without an exception, is sacred and worthy of worship. If God is to be found only in the heavens, nowhere else, sitting on a throne and ruling the worlds or dispensing justice, then He cannot be God but just an aspect of Him. If God favors only those who worship Him in a particular manner, calling Him by a particular name, and declares that every one else who does not follow those percepts will go to Hell, then He cannot be God, but an inferior aspect of Him. Hindus worship God according to their level of understanding. Some worship the highest God, some worship the village deities. Some worship a personal god believing him to be the Highest God. 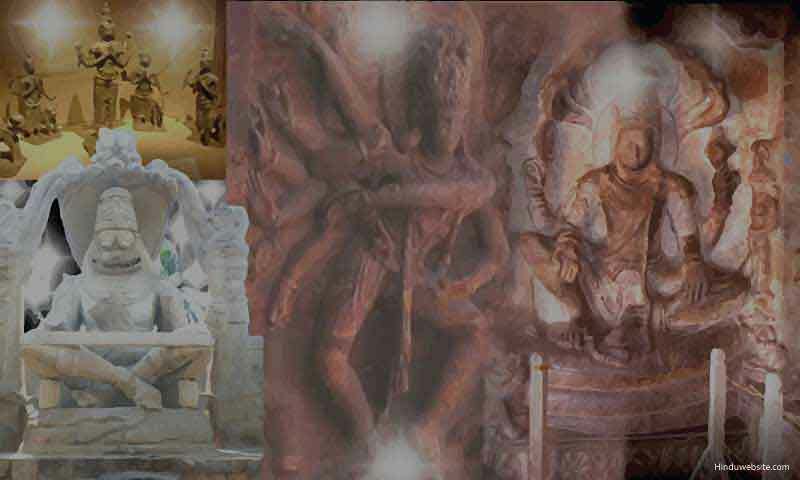 Some worship many gods simultaneously, with the belief that they all are the different manifestations of the same God. Some people worship Him in the form of images. Some worship His name by chanting His name or writing it a million or ten million times. Some make Him offerings of food and money. Some offer themselves completely. Some do not offer Him anything, but just worship Him either out of fear or want. Some do not worship Him at all, but still remain within the fold of Hinduism. In Hinduism there are many schools of thoughts and many layers of thoughts, because Hinduism is not the product of one prophet or one messiah and because it does not believe in the tyranny of religious dogmatism and in the stratification of human thought. It is a product of man's freedom of thought and of action. A constantly evolving and flowering religion, with many streams of thought assimilated in it, it is a product of mankind's history - a synthesis of many experiences and thought processes that make it extremely complex, but generously tolerant and lenient. It views the world as a playground of God where man has to resolve his illusions and pettiness and find the Hidden God. And it gives enormous time and opportunity to each individual to find Him in his or her own way. Some find Him. Some do not. Some do not bother at all and try to find something else: money, happiness, relationships, name, fame and so on. Hinduism waits for them patiently, knowing well the inevitable. There are many ways in which one can pursue the path of liberation. Hinduism broadly classifies them into three categories: the path of devotion, the path of knowledge and the path of duty and on each path an individual has many choices to work out his salvation. There are also many ways in which we can communicate with God. But broadly speaking we can put them into three main categories, namely physical communication, mental communication, and spiritual communication. We communicate with Him physically by worshipping His image or idol, treating with great respect, as if it is alive, and placing it with love and attention in our hearts and houses . We communicate with Him mentally by meditating upon His form, His words or His qualities. And finally, we also communicate with Him spiritually and intuitively through the silence of our minds and the loving nature our hearts as the inmost, invisible, infinite and divine Self of all. For Hinduism all these forms of worship and communion have their own relevance and importance in the spiritual evolution of man. It does not condemn any because each plays its own role at some stage or other in our lives. None will become a Mahatma (great soul) in a life time. For that he has to pass through many lives, make many attempts to purify himself and has to experiment with Truth. Therefore it is inappropriate and very much a sign of spiritual immaturity if any one condemns some methods of worship simply because he does not feel that way or does not agree with other methods of worship. Just as there are many ways in which you can pursue your education, there are many ways in which you can pursue God. It would be sheer stupidity to say that everyone should study history or science or literature or the same text book. Religion is a pathless land, as J.Krishnamurthy said , in which each individual has to find his own path. The Buddha said that unless you arrived at the Truth on your own, you did not arrive at it. Each individual has to work out his own salvation in a manner he deems fit. No individual or organization can claim copyright to the words of God. In the land of God, there are no quick fix formulae, no instant nirvana with a few scriptural studies. Can there be just one path to an ocean or only one way to reach any destination? If God is everywhere and is hidden in every thing, we must be able to find Him every where and in every form. Otherwise we are pursuing not God but something else. The gods and goddesses of Hinduism are real beings. They are unquestionably and undoubtedly manifestations of God Himself, who exist in space and time, not as a figment of our imagination or superstition, but as real beings capable of miraculous deeds. The personal experiences of countless number of Hindu saints and sages stand testimony to this fact. These sacred souls are born in every age and every generation and confirm beyond doubt that these gods and goddesses exist. The lives and experiences of saints like Sri Ramakrishna , Sri Ramana Maharshi, Swami Shraddananda, Swami Yogananda, Sri Aurobindo, Shridi Saibaba and many more whose names if enumerated would perhaps fill several pages, prove beyond doubt that the gods and goddesses exist in different planes of reality and would respond to us favorably if we pray to them with our hearts and minds. Therefore, for a Hindu the worship of gods and goddesses is not a mere superstitious idolatry but an act of faith and a form of communication, a way of placing our cares and concerns in the hands of God, the One Supreme Universal Self, of infinite dimensions, who envelops the worlds, the planets and the whole universe and is also hidden in them. The gods and goddesses are His different forms, the many hands, feet and faces of the one Supreme Purusha, the universal Self, by worshipping whom, in whatever form, none incurs sin and none goes to Hell. What about those who worship different kinds of human and animal spirits, village deities, and demi gods? The Bhagavad gita clearly explains the pitfalls of worshipping smaller gods and making offerings to them. Sri Krishna informs us clearly that those who worship smaller gods would go to them, while those who worship the Supreme Self would reach Him only. Hinduism therefore does not view favorably the practice of worshipping smaller deities, but does not condemn the worshippers either for choosing a circuitous path.